An e-reader shortage for the holidays? It seemed like this was going to be the holiday shopping season of the e-reader. But that was before Barnes & Noble told customers it had run short on pre-orders of its new electronic book reader, the Nook. 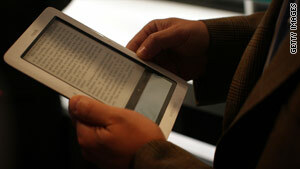 That device was poised to be a big holiday competitor to the more-established Amazon Kindle. Barnes & Noble says customers who pre-order the Nook now won't get the device until the week of January 4 - after the holiday shopping season. A limited number of the devices will be available for sale in some of the "highest volume" Barnes & Noble stores. In an e-mail, spokeswoman Mary Ellen Keating said early sales of the Nook beat the bookseller's expectations. "We had expected strong interest in Nook and pre-orders have exceeded those expectations. We’re excited to have such a wonderful response from customers," she wrote. Keating did not specify how many Nook readers have been sold. Customers can pre-order a Nook gift certificate in time for the holidays, according to a B&N blog post. The Sony Reader, another e-book competitor, also is not guaranteed to ship by the holidays, according to Sony's Web site. "Pre-orders will ship Dec. 18 thru Jan. 8. Actual delivery date cannot be guaranteed," the site says. Steve Haber, president of Sony’s digital reading division, tells the NYTimes that the company is being cautious. “We may be able to hit it [the Christmas delivery date]," he told the Times' Bits blog. "I just don’t want to promise someone a gift that arrives after Christmas. We may be giving up sales by saying that, but we are in it for the long haul." Amazon did not respond to a request for comment, but the company's Web site says its Kindle device can ship to customers as soon as the day after it's ordered.